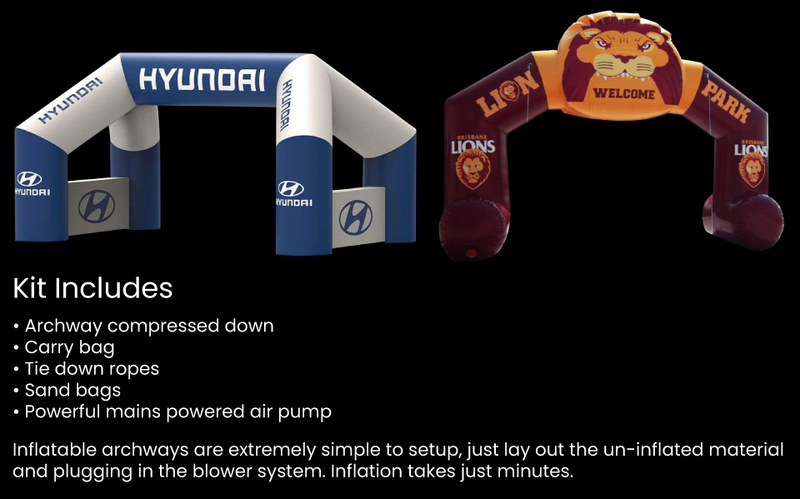 Promotional inflatable archway features full digital printing on entire unit. These are brilliant for all applications, from marathon runs to drag racing and track advertising. We can custom develop an inflatable archway to suit your requirements and size needs. Full colour print or removable pin up banners. Choice of PVC material or Oxford Polyester Material, Custom made to your exact size and colour requirements. Every seam in the Inflatable Archways are reinforced with an additional two-inch wide strip of vinyl. After the seams are R. F. sealed they are joined together with a double stitch, this creates 4-6 layers of strength. In high-stress related areas as many as 6 pieces of two-inch wide vinyl strips are used for added durability. A lap seam fold is also used in joining panels to give increased durability. Extensive work goes into constructing each and every inflatable item, from conception to completion. Our main emphasis in the building process is producing the finest, most durable products in the industry. *Information about our products ia intended as an approximate guide only. DynamicGift can not be held liable for any damage caused by the use of our products. For liability purposes we recommend you seek an independant evaluation of the area that the product will be used for and its intended purpose. As Dynamic Gift will not be held liable for any damage or injury caused by our products use.